The redesigned Interstate 15 interchange at California Oaks Road is an award-winning project. 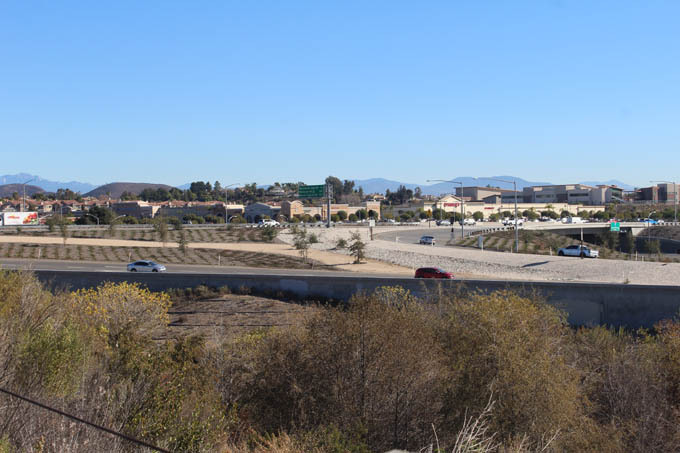 The City of Murrieta was recently honored with the 2015 Project of the Year Award by the American Public Works Association for the California Oaks Road Interchange Improvement project at Interstate 15, the city announced. The award was presented at a ceremony on Dec. 9. It is the second time Murrieta has won the award; it was also honored for the Clinton Keith Interchange Improvement project in 2012. Awards are presented annually to promote excellence in the management and administration of public works projects in categories including buildings, water, facilities, recreation and athletic facilities, traffic and transportation. The California Oaks project reconfigured the existing diamond interchange into a modified partial cloverleaf. The bridge was widened, retaining walls were installed, and utility and electrical improvements were made. "It's always an honor to be recognized for a project that has brought such benefit to the Murrieta community," said Mayor Randon Lane. "The California Oaks Interchange Project improved traffic flow within an area that has seen significant economic developing in the past five years. I'm pleased to hear the feedback from residents has been so positive."